Customs and traditions are an inherent part of the rich Indian culture. In India, a lot of festivals occur one after the other, throughout the year. Each and every festival celebrated in India has its own social and cultural importance. 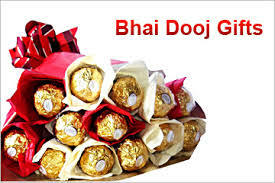 Among these, one of the most significant and awaited festival is the Bhai Dooj festival. The festival is named Bhai Dooj as it focuses on the brothers, and celebrated on the second day after the new-moon (Amavasya), or Diwali day. This day is also the third day of the Kartik month, according to the Hindu calendar. It is believed that once Yamraj (the god of death) visited her sister Yami. His sister became very delighted to see him and applied a tilak on his forehead. At this, Yamraj became so happy that he announced that the person whose sister will apply tilak on his forehead on that day would become free from the fear of death and hell. From that day, the tradition of Bhai Dooj came into existence. Another mythological tale says that after killing the devil named, Narkasur, lord Krishna went to his sister Subhadra. The day on which lord Krishna visited his sister was the second day after the new-moon day, or the dooj day. Subhadra gave her brother a warm welcome by doing his arti, applying a tilak on his forehead, sprinkling flowers over him, and offering him sweets. 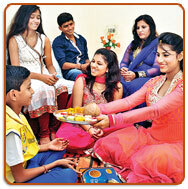 From then onwards, it became a tradition and got fame as the Bhai Dooj festival. 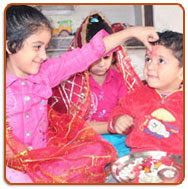 On the auspicious and delightful occasion of Bhai Dooj, sisters apply tilak (a holy mark) on their brothers' forehead. They perform artiof their beloved and caring brothers and offer sweets to them, as well. Brothers also take pledge of their sisters' safety and give them some gift or present as a reciprocation. Bhai Dooj is really a great festival, which clearly reflects the customs and traditions of India. 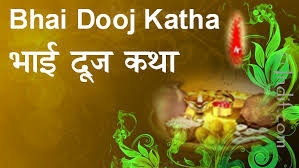 Bhai Dooj / Bhau-Beej / Bhai Tika / Bhai Phonta is a festival celebrated by Hindus of the Indian subcontinent, notably India and Nepal, on the second lunar day of Shukla Paksha (bright fortnight) in the Vikram Samvat Hindu calendar or of Shalivahan Shaka calendar month of Kartika. It is celebrated during the Diwali or Tihar festival. 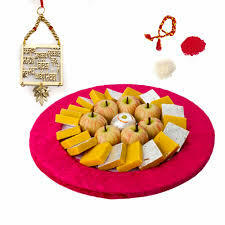 The celebrations of this day are similar to the festival of Raksha Bandhan. On this day, brothers get gifts from sisters.However,in Maharashtra, the brother gives gifts to his sisters. 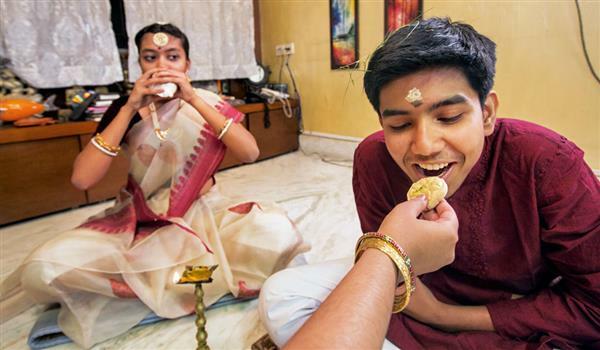 Bhai Dooj (Hindi: भाई दूज) in entire Northern part of India, observed during the Diwali festival. This is also the second day of the Vikrami Samvat New Year, the calendar followed in Northern India (including Kashmir), which starts from the lunar month of Kārtika. It is widely celebrated by Awadhis in Uttar Pradesh, Maithils in Bihar and people from various other ethnic groups. The first day of this New Year is observed as Govardhan Pūja. Bhai Tika (Nepali) in Nepal, where it is the most important festival after Dashain (Vijaya Dashmi / Dussehra). Observed on the fifth day of Tiharfestival, it is widely celebrated by Newari, Tharu, Bahun and Chhetri people. Bhai Phonta (Bengali: ) in Bengal and it takes place every year on the second day after Kali Puja. Bhai Bij, Bhau Beej, or Bhav Bij (Marathi: amongst the Gujarati, Marathi and Konkani-speaking communities in the states of Gujarat, Maharashtra, Goa and Karnataka. Other names include Bhatru Dviteeya, or Bhatri Ditya. According to a popular legend in Hindu mythology, after slaying the evil demon Narakasura, Lord Krishna visited his sister Subhadra who gave him a warm welcome with sweets and flowers. She also affectionately applied tilaka on Krishna's forehead. Some believe this to be the origin of the festival. On the day of the festival, sisters invite their brothers for a sumptuous meal often including their favorite dishes/sweets. The procedure may be different in Bihar and central India. The whole ceremony signifies the duty of a brother to protect his sister, as well as a sister's blessings for her brother. Carrying forward the ceremony in traditional style, sisters perform aarti for their brother and apply a red tika on the brother's forehead. 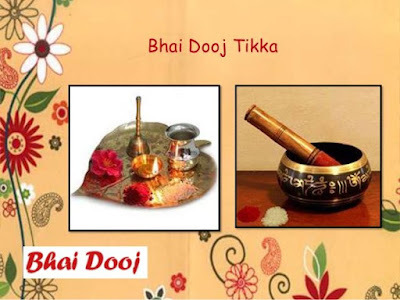 This tika ceremony on the occasion of Bhai Bij signifies the sister's sincerest prayers for the long and happy life of her brother and treat them with gifts. In return, brothers bless their sisters and may treat them also with gifts or cash. As it is customary in Haryana, Maharashtra to celebrate the auspicious occasion of Bhau-beej, women who do not have a brother worship the moon god instead. They apply mehendi on girls as their tradition. The sister whose brother lives far away from her and can not go to her house, sends her sincerest prayers for the long and happy life of her brother through the moon god. She performs aarti for the moon. This is the reason why children of Hindu parents affectionately call the moon Chandamama (Chanda means moon and mama means mother's brother). Bhai Phonta in West Bengal is celebrated with much splendor. The ceremony is marked with many rituals along with a grand feast arranged for the brothers.It is necessary that, both brother and sister are more than 5 years of age. The festival of Bhai Bij is popular in Haryana, Gujarat, Maharashtra and Goa and is celebrated with great fervour and gaiety. Brothers and sisters look forward to the occasion with immense enthusiasm. To add charm to the occasion, Bhai Bij gifts are exchanged between brothers and sisters as a token of love and appreciation. Special dishes for the festival include the Maharashtra sweet called basundi poori or kheerni poori. On this occasion sisters give gifts to their brothers. India is a land of festivals, and customs and traditions are integral part of Indian culture. Every festival is culturally important in its own self. And one such festival happens to be Bhai Dooj. This festival falls on the second day after Diwali and its spirit is to cherish the bond of love and affection that brother and sister share. Bhai Dooj is one of the most awaited festivals that display unique cultural traditions in different regions of India. The festival of Bhai Dooj develops within us the feeling of love and care towards our siblings. On this day, sisters invite and offer their brothers with scrumptious meal. A special square shaped space is drawn with flowers and beautified with corn powder by sisters. As per the tradition, the brothers have to step in that square area. Before he enters it, brother is made to eat a bitter fruit. There's a legend related to it, which says that Lord Krishna tasted this fruit before he went to slay the demon Narakasura. And after killing the demon, Krishna visited his sister Subhadra who welcomed him heartily by applying tilak on Krishna's forehead. Since then the custom of celebrating Bhai Dooj or Bhaubeej started. Carrying this occasion in traditional style, sisters decorate puja thalis with sweets, tika, rice, coconut and flowers. Brothers sit in front of their sisters with covered heads, and sisters perform aarti and apply tika on their forehead. She then presents him with sweets and prays to god for his long life and good health. The tradition of gifting is also involved in this festival. The brother reciprocates by showering blessings and gifts on his sisters. Gifts may be in cash or kind, depending upon the understanding of brother-sister. Women who have no brother, worship moon God on this auspicious occasion. Also, brothers have to visit their sisters on this day and fulfil the custom of 'Bhagini Hastha Bhojanam', which means brothers have to consume the meal prepared by their sisters. This tradition was started by Lord Yama, God of Death. He when visited his sister Yamuna, she welcomed him warmly by adorning his neck with garland, and applying tika on his forehead. She served him a lavish meal. Yama delighted by her gesture declared that whoever receives tika from his sister on his day will bring himself good luck, good health and prosperity.